Concept cleverly thought of by Steve Haslip, a graphic designer from England. The concept was fairly simple: I buy t-shirts online and they always come wrinkled and I always run out of coat-hangers. So I designed a sustainable, reusable way to send and keep your t-shirts. As you open the package you create a coat hanger. 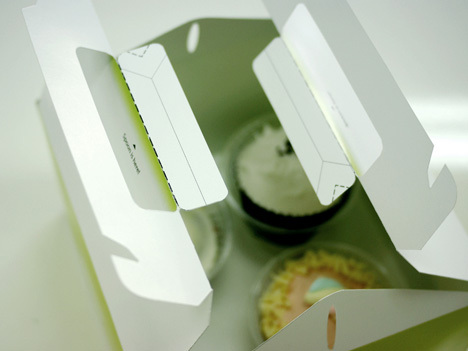 The packaging could be made from recycled material whether it is card or plastic and the only waste is the green tear-away tab. This project won a FIRST prize in the D&AD Student Awards 2007 category ‘What else do you do?’. Plastic spoons that come with takeout foods are inefficient and “ungreen” so the challenge was to find the most cost effective remedy while giving Earth one less thing to worry about. Ideally you should carry your own flatware but if you don’t mind a little kitsch, check out the Spoon and Box. 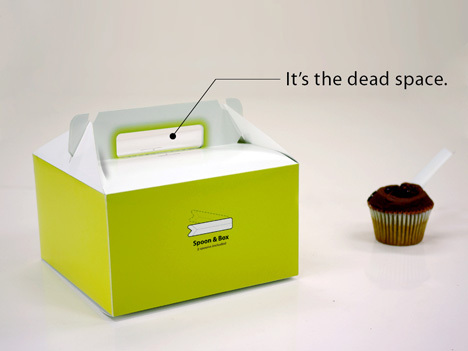 The handle is a perfect spot to hide a precut spoon. Just turn it inside out (the clean side) and you’re ready to eat. 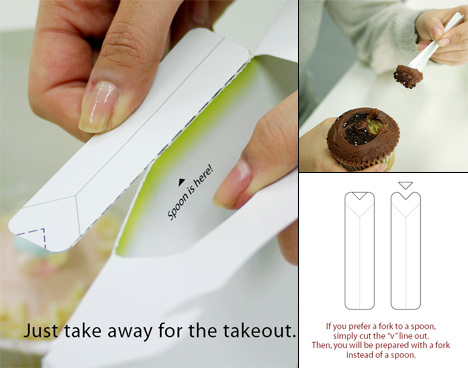 It can even turn into a spork for those sporky occasions. Works fine for dry foods but I wouldn’t go dipping into some greasy chili fries or Chinese food with it. So did we really solve any problems here?